I’ve been looking into fitting Rover V8 Twin Throttle Bodies. Rover did it on a limited number SD1 Vitesse’s. I wanted to modify a Thor Manifold; for it’s looks and height; to twin plenums. The trouble was, I had no idea what size throttle bodies I needed. There are those that reckon a Rover V8 with a 72mm throttle body and 41mm inlet trumpets is good for 360bhp. So I decided to do some maths, but firstly I read this Designing, Modifying and Building Intake Manifolds. A 4.6L (4538cc) Rover V8 is 276.9ci. Power drops off above 5750rpm, whilst many reckon to keep the hydraulic tappets healthy 5500rpm is a good red-line. The throttle flap mechanism takes up part of the area, so the 68mm Thor Throttle body, on a single plenum aligns reasonably with these sums. Even though the hydraulic tappets won’t like it, the Rover V8 will rev to nearly 6250rpm, taking the diameter up to 68.3mm. Each bank of 4 cylinders is 138.5ci. I’d need an intake that has a 45.3mm inside diameter to have 180ft/sec air velocity at 5750rpm. Adjust that to take out the throttle flap and increase the rpm to 6250 and your at 48.3mm. Currently, my Rover V8 is not tuned, so I plan on using a pair of alloy 48mm MGF alloy throttle bodies. If they are too small I can increase to 52mm or even up to a pair of 60mm CNC after-market throttle bodies. With a shared plenum each cylinder bank shares the same throttle body. Each Inlet is sucking through a 65mm throttle body. There will always be some overlap in valve opening times, meaning 2 inlets are simultaneously drawing through the same body. As the inlet valve on cylinder 1 is closing, the inlet on 8 will be opening. By switching to a modified Thor manifold, each cylinder bank has it’s own plenum. There will be no inlet opening overlap, so the throttle body size could be reduced slightly. By going to a modified Thor manifold I’ll also need two Inlet Air Controllers (IAC), which will probably mean I’ll need to upgrade the driver FET inside the Megasquirt. 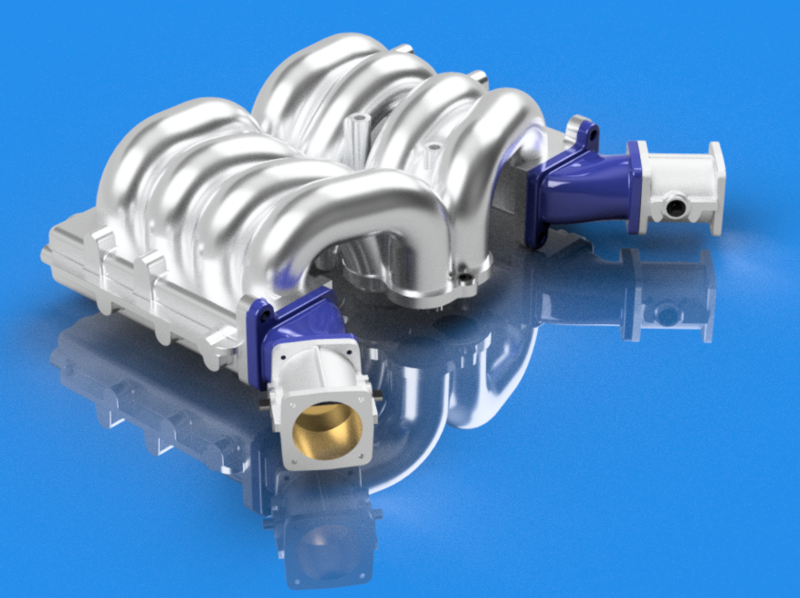 The standard SD1 through P38 GEMS manifolds use a 65mm Throttle Body built into the plenum chamber. If performance was my goal, then boring out this manifold to 72mm would be the best option. If however, like me, height was the primary factor then a modified Thor manifold might be an option. The Thor manifold uses a separate 68mm throttle body (MHB000240). The SD1 Vitesse Twin plenum had either twin 65mm (prototype) or 68mm (road) built into the plenum chamber. The similar capacity 16valve 4.6Litre Mustang uses a pair of 60mm throttle bodies (JQMT60CRB02). The K series Rover engine uses 48mm and 52mm throttle bodies. Whilst I’m planning the inlet manifold changes, I’ve still got the stainless exhausts to sort out.